Waterfowl are mating in winter and they can be found in huge flocks — sometimes numbering in the tens of thousands! 1 – Sacramento NWR, California – Although the numbers are down from 40 years ago, it is still possible to see tens of thousands of waterfowl at this 10,000 acre wildlife sanctuary in California’s Central Valley, about 70 miles north of Sacramento. 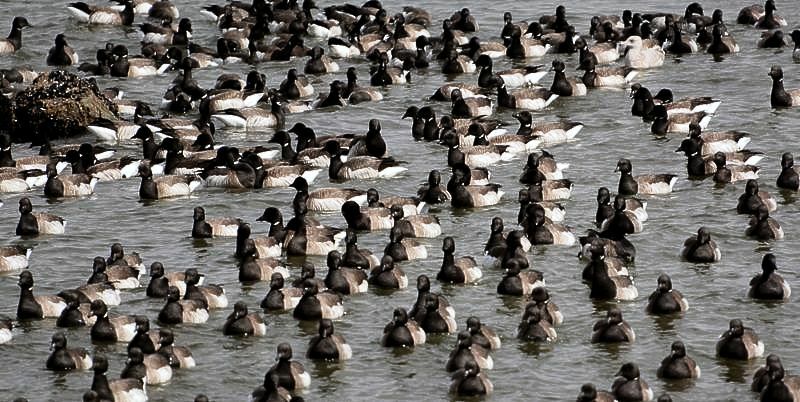 Recently 20,000 Snow Geese were reported, along with 1500 Northern Shovelers, over 2000 Northern Pintails and about 1000 American Coots, according to lists reported on eBird. 2 – Montauk Point State Park, New York – This Important Bird Arealives up to its designation with the ability to support and deliver huge quantities of birds. Get your fill of winter sea ducks by heading for the Lighthouse to start. Recent eBird checklists show hundreds of Scoters, Eiders and Long-tailed Ducks along with other waterfowl, just waiting for you. At the very eastern tip of Long Island, Montauk is a great place to start your visit to a variety of very birds spots in winter in the area. 3 – Laguna Atascosa NWR, Texas – If you are looking for a little warmer place to see waterfowl, this Gulf coast location near Padre Island is a good choice. You will see a variety of waterfowl from huge numbers of American Coots to shovelers, shorebirds, Sandhill Cranes and some songbirds as well. It’s a good all-around spot for birding. For a few more spots that offer great winter waterfowl viewing, check out this list from Cornell Lab of Ornithology.